Robison Anton Thread is the embroidery industry's favorite embroidery thread. Robison Anton Thread is ideal for all home and commercial embroidery machines and far superior to old fashioned spools. Robison Anton Thread has a bright, highly lusterous sheen and is smooth running. Robison Anton 40wt Rayon Thread is smooth and easy running, with a brite high-luster sheen. Shinier than Polyester. Bleach resistant and a great value. Hundreds of colors to choose from. 5500yd cone orders may take an extra day to process. We also carry Robison Anton Rayon Thread Sets! 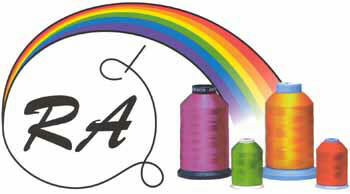 Robison-Anton 40wt Polyester Thread is ideal for any type of embroidery machine. Polyester thread is stronger than Rayon thread. Robison-Anton Thread is bleach resistant and a great value. 5500yd cone orders may take an extra day to process. We also carry Robison Anton Polyester Thread Sets! Robison-Anton 50wt Mercerized 100% Egyptian Cotton Quilting Thread. For Machine Quilting or Hand Quilting. Robison-Anton cotton quilting thread is the market's leading quilting thread. We also carry Robison Anton Cotton Quilting Thread Sets! Robison-Anton J Metallic Thread is designed for Embroidery, Embellishment and all other Decorative Applications. Runs Exceptionally Well with all Embroidery Threads on all Embroidery Machines. Robison Anton 40wt Rayon Variegated Thread is smooth and easy running, with a brite high-luster sheen. Robison Anton Twister Tweed is formed by 2 colors twisted together to provide the designer with an infinite number of design possibilities for all embroidered items. Designed to run with Super Strength Rayon Colors. Robison Anton Moonglow 40wt Thread recharges with any available light source. You can light up your work with Robison Anton Moonglow Glow-In-The-Dark Thread.